Exercise is a great way to increase metabolism, but after a workout metabolism ultimately returns to baseline levels. The elevated metabolism following exercise is referred to asexcess post-exercise oxygen consumption, or EPOC. 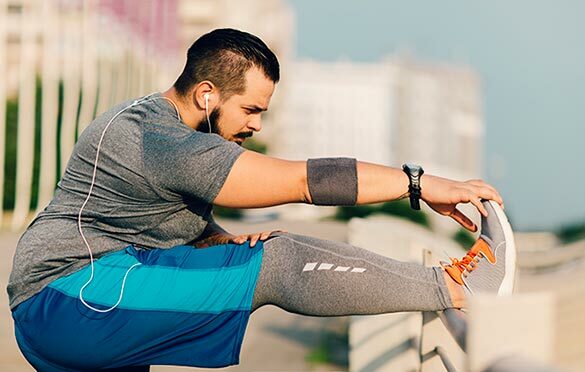 Research has shown that numerous factors contribute to EPOC, and that it can play a significant role in both weight loss and weight maintenance. This article examines the phenomenon of EPOC and how it can be used to assist clients with weight loss and weight maintenance. 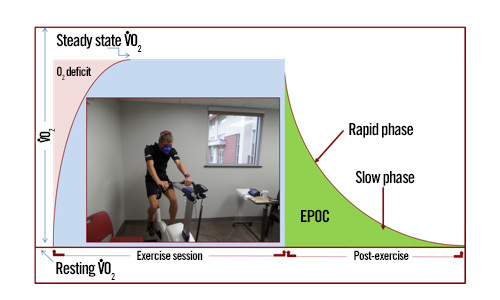 Post-exercise oxygen consumption (VO2) gradually returns toward baseline levels in an exponential manner, demonstrating an initial rapid component followed by a slow, longer component (Figure 1). The overall VO2 that is consumed above resting values during this phase is referred to as EPOC. It was originally proposed in 1923 (Hill and Lupton, 1923) that the elevated VO2 following exercise was an oxygen debt; this interpretation was based on the understanding that there would be an oxygen cost involved with replenishing creatine phosphate and also oxidation of lactate produced from glycolysis (i.e., the oxygen deficit). More recently, it has been acknowledged that additional factors beyond those recognized by Hill and Lupton contribute to post-exercise VO2. In reality, elevated post-exercise metabolism is a product of widespread homeostatic perturbation of which the settlement of the oxygen deficit is only a fractional contribution. Accordingly, in 1984 the term EPOC was coined to better represent the multiple factors that contribute to elevated post-exercise metabolism (Gaesser and Brooks, 1984). The phenomenon of EPOC refers to a post-exercise elevation in metabolism and consists of a phase of excess oxygen consumption (VO2) that persists into the recovery period. EPOC consists of a rapid phase (lasting between several minutes and one hour) and slow phase (lasting 12 to 48 hours). As depcited here, exercise training combined with a sauna suit is a strategy that can be used to augment EPOC. Overall, EPOC generates approximately 10 percent of the total energy expenditure of exercise (LaForgia, Withers and Gore, 2006). Further, an increase in post-exercise metabolism of 80 to 100 calories is generally considered to be a meaningful EPOC. It is important to appreciate the long-term benefits accrued from modest increases to overall exercise energy expenditure stemming from an elevated EPOC. For example, the cumulative effect of EPOC over a one-year period could be the energy expenditure equivalent of 3 to 6 pounds of fat. Given the potential contribution of EPOC to weight loss and energy balance (i.e., weight maintenance), it’s an important parameter to account for when designing and evaluating the effectiveness of exercise training programs. Not surprisingly, research has reported that the intensity of an exercise bout has the greatest impact on EPOC. Importantly, it has been demonstrated that a threshold moderate-intensity corresponding to 50 to 60 percent of VO2max [this equates to 50 to 55 percent of heart rate reserve (HRR)] must be exceeded to elicit a substantial magnitude and duration of EPOC (LaForgia, Withers and Gore, 2006). Research has consistently demonstrated that the duration of aerobic exercise has a strong influence on overall EPOC magnitude and duration, as long as the necessary threshold intensity has been satisfied. For instance, in a group of men and women, EPOC increased more than fivefold (from 34 to 180 calories) when exercise time on a cycle ergometer was increased from 30 minutes to 60 minutes at an intensity of 70 percent VO2max (Chad and Wenger, 1985). In a similar manner, Quinn and colleagues (1994) found that EPOC was nearly doubled (43 calories vs. 76 calories) in a group of women who performed treadmill walking at 70 percent VO2max exercise when duration was increased from 20 minutes to 60 minutes. Prolonged exercise will lower muscle glycogen stores, and post-exercise replenishment of muscle glycogen is one of the mechanisms believed to be responsible for the greater EPOC following longer-duration exercise (Børsheim and Bahr, 2003). Recommended training strategy: Integrate at least one long-duration exercise session into the weekly training program. Magnitude of EPOC: Individuals performing a prolonged 60-minute bout of exercise at a vigorous intensity of 75 to 80 percent of maximal heart rate (MHR) can expect to elicit an average EPOC between 75 to 100 calories. This equates to 4,000 to 5,000 calories over the course of the year (or 1 to 1.5 pounds of fat mass). High-intensity interval training (HIIT) involves alternating brief bouts (30 seconds to 5 minutes) of higher-intensity sessions with either rest or lower-intensity workloads throughout an exercise routine. Research confirms that HIIT is a time-efficient strategy for improving numerous health parameters. Additionally, HIIT also generates a sizeable and prolonged EPOC. 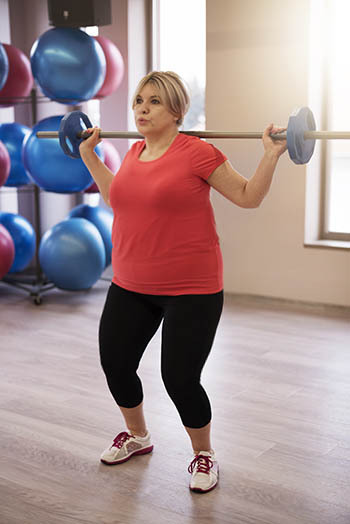 For example, one study concluded that EPOC was nearly doubled (17.4 calories vs. 9 calories) in a group of 10 women (five lean and five obese) who performed a treadmill-based HIIT session comprised of three-minute bouts at 90 percent VO2max interspersed with three-minute bouts at 30 percent VO2max, when compared to a moderate-intensity, intermittent exercise session consisting of three-minute bouts at 60 percent VO2max separated by three-minute bouts at 30 percent VO2max (Kaminsky and Whaley, 1993). In a more recent study, a group of Norwegian researchers compared the effectiveness of different volumes of HIIT bouts with a traditional moderate-intensity, continuous exercise training bout on the magnitude and duration of EPOC in a group of men with metabolic syndrome. The moderate-intensity, continuous exercise bout was performed for 47 minutes at 70 percent of MHR, while the HIIT sessions consisted of either a single interval bout or four interval bouts. All interval bouts were four minutes in duration and performed at an intensity of 90 percent of MHR. Three-minute active recovery bouts were performed at an intensity of 70 percent of MHR when the four-interval bout session was completed. The overall EPOC duration was longest following the 4 x 4 HIIT session (70 minutes) when compared to the 1 x 4 HIIT session (36 minutes) or the moderate-intensity, continuous exercise training session (46 minutes). Additionally, the magnitude of EPOC was 50 percent higher after the 4 x 4 HIIT session when compared to both the 1 x 4 HIIT session and the moderate-intensity, continuous exercise training session. Overall, a 4 x 4 HIIT session yielded an extra 15 calories of energy expenditure (Larsen et al., 2014). The main mechanism by which HIIT increases EPOC magnitude and duration is through the production of lactate, which must eventually be oxidized post-exercise. Magnitude of EPOC: An individual performing regular HIIT, consisting of two sessions per week of 4 x 4 minutes at 90 percent of MHR, would expend an extra 30 calories per week. This equates to a rather modest 1,500 calories over the course of the year, which approximates to a half-pound of fat mass. Perhaps more importantly is the fact that HIIT rapidly improves fitness levels. Increased fitness levels permit individuals to perform longer duration and more vigorous bouts of exercise, which will ultimately elicit a higher EPOC (as described in the previously recommended training strategy). Research supports resistance training as an effective strategy for augmenting EPOC. The mechanisms responsible for greater EPOC values stemming from resistance training include increased protein turnover and tissue repair (Børsheim and Bahr, 2003). Increased resistance-training volume and intensity are each linked with higher EPOC values; however, many previous protocols that have been studied would likely not be well-tolerated in the non-athletic population. In contrast, circuit-training routines consisting of more modest intensities and volumes coupled with shorter rest intervals appear to be a better alternative for the overweight or obese client. For example, Haltom and colleagues (1999) showed a circuit routine [two sets, eight exercises, 20 repetitions, 75 percent of 20-repetition maximum (20-RM), 20 seconds rest] elicited an EPOC of 50 calories among a group of men. More recently, in a cohort of women that did not previously strength train, it was demonstrated that circuit training (three sets, seven exercises, 50 to 55 percent of 1-RM) stimulated an EPOC equating to 35 calories (Da Silva, Brentano and Kruel, 2010). Recommended training strategy: Integrate two to three resistance-training sessions into the weekly training program. Magnitude of EPOC: An individual performing regular resistance training consisting of two to three sessions per week of circuit-style workouts would expend an extra 85 to 130 calories per week. This equates to a rather modest 4,400 to 6,700 calories over the course of the year, which approximates to a 1 to 2 pounds of fat mass. More importantly, regular resistance training helps to increase and maintain lean body bass, which promotes a greater resting metabolic rate over the long-term. Contemporary evidence has demonstrated that systemic thermal therapy by regular administration of heat through a variety of methodologies (e.g., sauna and hot tub) affords a number of advantageous responses with respect to cardiovascular health. Indeed, chronic exposure to heat stress (in the form of sauna bathing) has been reported to be associated with a reduced risk of cardiovascular disease and mortality from all causes (Laukkanen et al., 2015). Additionally, it has also been reported that heat therapy reduces body weight and adiposity (Krause et al., 2015). Moreover, there is also evidence that exercise in conjunction with heat therapy provides cardiovascular health benefits. For instance, it has been demonstrated that three weeks of post-exercise sauna bathing elicits an improvement in cardiorespiratory fitness (Scoon et al., 2007). Recently, researchers investigated the combined effects of exercise training with a sauna suit on exercise metabolism and EPOC. Van De Velde and colleagues (2016) had 12 men complete four experimental trials: (1) 30 minutes of moderate-intensity exercise (55 to 60 percent HRR) with a sauna suit; (2) 20 minutes of vigorous-intensity exercise (75 to 80 percent HRR) with a sauna suit, (3) 30 minutes of moderate-intensity exercise (55 to 60 percent HRR) without a sauna suit (i.e., control), and (4) 20 minutes of vigorous-intensity exercise (75 to 80 percent HRR) without a sauna suit (i.e., control). The researchers reported a significant increase in post-exercise metabolism, as evidenced by a greater EPOC, when individuals exercised with the sauna suit when compared to the control condition. In the moderate-intensity exercise trial condition, there was approximately 45 percent greater EPOC with the sauna suit (70 calories) vs. control condition (45 calories). Likewise, in the vigorous-intensity exercise trial condition there was approximately 20 percent greater EPOC with the sauna suit (88 calories) vs. control condition (72 calories). It is also worth noting that an important methodological aspect of the study by Van De Velde et al. (2016) was that the participants exercised at durations (20 minutes and 30 minutes) and intensities (moderate and vigorous) that align with current widespread recommendations for physical activity (American College of Sports Medicine, 2014). While the authors also reported that exercise with a sauna suit was safe, it is important to note that it is not appropriate for everyone. 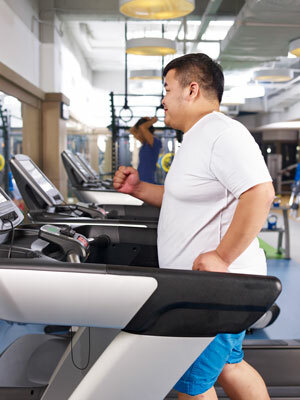 Extreme caution should be taken to ensure the client is exercising safely and does not experience ill effects. Recommended training strategy: Combine exercise training with a sauna suit, but only for healthy clients. Individuals with chronic conditions should first consult with their physicians prior to wearing a sauna suit. Magnitude of EPOC: An individual performing regular exercise training with a sauna suit, and following a routine consisting of two bouts of vigorous-intensity exercise combined with three bouts of moderate-intensity exercise, would expend an extra 376 calories per week. This equates to 20,000 calories over the course of the year, which is the equivalent of nearly 6 pounds of fat mass. American College of Sports Medicine (2014). ACSM’s Guidelines for Exercise Testing and Prescription (9th ed). Philadelphia: Wolters Kluwer/Lippincott Williams & Wilkins. Børsheim, E. and Bahr, R. (2003). Effect of exercise intensity, duration and mode on post-exercise oxygen consumption. Sports Medicine, 33, 1037-1060. Chad, K.E. and Wenger, H.A. (1985). The effects of duration and intensity on the exercise and post-exercise metabolic rate. Australian Journal of Medical Science, 17, 14-18. Da Silva, R.L., Brentano, M.A. and Kruel, L.F. (2010). Effects of different strength training methods on post-exercise energetic expenditure. Journal of Strength and Conditioning Research, 8, 2255-2260. Gaesser, G.A. and Brooks, G.A. (1984). Metabolic basis of excess post-exercise oxygen consumption: A review. Medicine & Science in Sports & Exercise, 16, 29-43. Haltom, R.W. et al. (1999). Circuit weight training and its effects on excess post-exercise oxygen consumption. Medicine & Science in Sports & Exercise, 9, 31, 1613-1618. Hill, A.V. and Lupton, H. (1923). Muscular exercise, lactic acid, and the supply and utilization of oxygen. Quarterly Journal of Medicine, 16, 135-171. Kaminsky, L.A. and Whaley, M.H. (1993). Effect of interval type exercise on excess post-exercise oxygen consumption (EPOC) in obese and normal-weight women. Medicine Exercise Nutrition and Health, 2, 106-111. Krause, M. et al. (2015). Heat shock proteins and heat therapy for type 2 diabetes: Pros and cons.Current Opinion in Clinical Nutrition & Metabolic Care, 18, 374-380. LaForgia, J., Withers, R.T. and Gore, C.J. (2006). Effects of exercise intensity and duration on the excess post-exercise oxygen consumption. Journal of Sports Science, 24, 1247-1264. Laukkanen, T. et al. (2015). Association between sauna bathing and fatal cardiovascular and all-cause mortality events. JAMA Internal Medicine, 175, 542-548. Larsen, I. et al. (2014). High- and moderate-intensity aerobic exercise and excess post-exercise oxygen consumption in men with metabolic syndrome. Scandinavian Journal of Medicine & Science in Sports, 24, e174-179. Quinn, T.J., Vroman, N.B. and Kertzer, R. (1994). Post-exercise oxygen consumption in trained females: Effect of exercise duration. Medicine & Science in Sports & Exercise, 26, 908-913. Scoon, G.S. et al. (2007). Effect of post-exercise sauna bathing on the endurance performance of competitive male runners. Journal of Science and Medicine in Sports, 10, 259-262. Van de Velde, S.S. et al. (2016). Effects of exercise training with a sauna suit on cardiovascular health: A proof-of-concept study. International Journal of Research in Exercise Physiology, 11, 1-10. Lance C. Dalleck, Ph.D., is an assistant professor of exercise and sport science at Western State Colorado University. His research interests include improving exercise performance and health outcomes through evidence-based practice, quantifying the energy expenditure of outdoor and non-traditional types of physical activity, and studying historical perspectives in health, fitness and exercise physiology. Samuel S. Van De Velde is a graduate student in the High Altitude Exercise Physiology program at Western State Colorado University. His research interests include the impacts of acute and chronic environmental stressors on endurance performance. He is also interested in primary/secondary prevention of cardiovascular disease, and quantifying the energy expenditure of outdoor and non-traditional types of physical activity.